Dried chicken dog treats are a good choice for dogs that might have a wheat or grain allergy. These treats are not intended as a primary meal, but provide a crunchy alternative for dogs that may need protein-rich treats due to health issues. 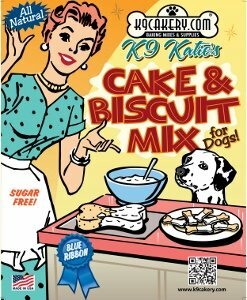 These healthy dog treats are very easy to make. They only have one ingredient: chicken! 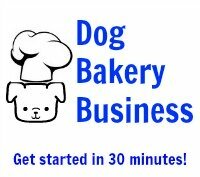 A dehydrator is the best choice to make these dehydrated dog treats. However, if you do not own a dehydrator, you do not have to run out and purchase one unless you plan to make other dehydrated treats. Then the investment would be worth it. A dehydrator works to remove all the moisture. Professional bakeries need this requirement to increase shelf-life. Spoilage occurs from left-over moisture and fat. 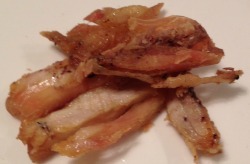 The less moisture, the crispier the resulting strips become. Dogs will enjoy chewing on a crispy treat - it is more of a challenged than a mushy one! You can use your conventional oven. It will likely take more time because an oven is not meant to be a dehydrator, but you can achieve a similar result. Bake at 200 degrees for 3-4 hours to dry out the chicken strips. You will have to adjust the timing depending on how moist the strips are. Moister chicken will require more time in the oven to dry out. Cool the strips down completely. You can use the thighs or legs. However, the darker chicken meat is moister due to higher fat content. Just be sure to adjust the time in the oven for drying out. These dog treats are a very popular item sold in pet stores. If you plan to purchase these treats, be sure to check the label and make sure they were made in the USA if possible. The FDA, the Food and Drug Administration, has stringent requirements that must be followed for a food product to be sold in the USA. Other countries may have less stringent standards. The internet is full of stories about pets who ingested non-USA made products and became ill or died. The types of substances found in some of these products made in other countries is astounding as to what finds its way into the finished product. There could be contaminants or just the use of tainted product. These cheap dog treats are often sold in bulk at a very low price. It is worth your dog's health to make your own or pay a little more to keep your pet safe.